Situated in the heart of the Lakes Corridor, the village offers an uncomparable landscape that you will not forget. Officially founded on 15th May 1935, La Angostura is a typical mountain village with small buildings and abundant vegetation. It is a beautiful and peaceful spot where time has passed but the population has not grown abruptly. For all this, we recommend this 4 days cycling leaving from Automovil Club Argentino in the center of the village, an ideal outing to do with the family. On the first day you will go east leaving from the village and taking route 237 to visit two spectacular places. First, Rio Bonito, 5 km . from the village. You must cycle on the route, and after passing by Cerro Bayo, you get to the river, where you must leave the route to go skirting the water. It is a wonderful place to sit on the rocks on the shore. After a while, you must return to the route and go on cycling in the same direction. One kilometer ahead is Bahia Manzano, a dream-like place of Villa La Angostura. Dust roads, thick vegetation, and two bays in Nahuel Huapi lake: a perfect place to spend the afternoon and have a snack near the water. 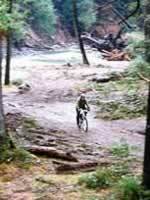 It is important to leave before sunset, since it is not advisable to ride in the dark. You can ride in a north-west direction. You must leave the village through Av. Siete Lagos and after one kilometer you will find a crossroad, Cacique Antriau street. There you must turn to the right to start climbing to Cerro Beldevere. After a while you get to the viewpoint from where you have some great views of lakes Correntoso, Nahuel Huapi and Espejo. The climb is quite exhausting and the descent is pleasant. Then you must take Av. 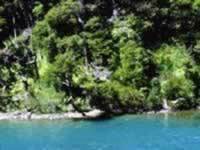 Siete Lagos and ride on one kilometer to the turning point on the left to Correntoso river, which joins lakes Correntoso and Nahuel Huapi. There is a beautiful wooden bridge from where you can see the trout swimming and watch lakes Nahuel Huapi or Correntoso. When you return to the route, you ride on 4 kilometers to the crossing to San Martin de los Andes to the right or to Chile through Cardenal Samoré International Pass. This is an impressing outing with plenty of adrenaline. Return to route 237 and then take the road to Cerro Bayo, a 6 km . debris road in ascension. 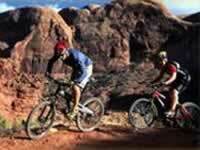 In case you do not feel fit enough to do it, you can hire a van to the base of the mountain. 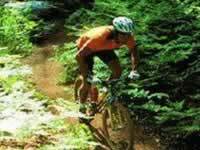 In Cerro Bayo you must take the lift with your bicycle to Club Andino's shelter and from there cycle through a road from where you will have a magnificent view of the village from the height, as well as Mount Tronador, Isla Victoria, Bariloche and the needles of Mount Catedral. When you get back to the base you have time to have lunch ad get ready for a spectacular descent from the mountain to the village, 9 km . downslope. Watch out. The descent through this debris road may be dangerous if you are not wearing your helmet. It is a winding road and you will de riding very fast. If everything turns out all right you will be arriving to the village before dusk. It is time to go to the port of Villa La Angostura. You must leave from Automovil Club Argentino, turn left and cycle some three kilometers. You will see a beautiful wooden dock belonging to Prefectura Naval Argentina. There is the access to Los Arrayanes National Park in Quetrihue peninsula. 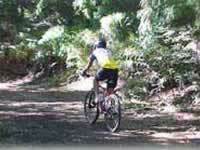 It is really worth visiting this magnificent 12 hectares Arrayanes forest. The forest is 12 kilometers from the village, and full of white flowers on cinnamon color trees coexisting with other species like palo santo, laurel and winter's bark and birds like thrushes, chucao tapaculos, herons, hualas and black-crowned night herons. In a word, you should not miss this whole day full nature outing. Back in the port in the afternoon you might be exhausted. But there is still more. Before the end of the day you can visit Asunción Chapel, founded by the religious missions, on the way to the center of the village. Thus concludes your cycling tour in Villa La Angostura , an hallucinating Andean spot.